Osage City Manager Nick Hernandez will end a three-year term with the community July 15. OSAGE CITY—Osage City’s city manager resigned during an early-morning special meeting called by the mayor June 16. 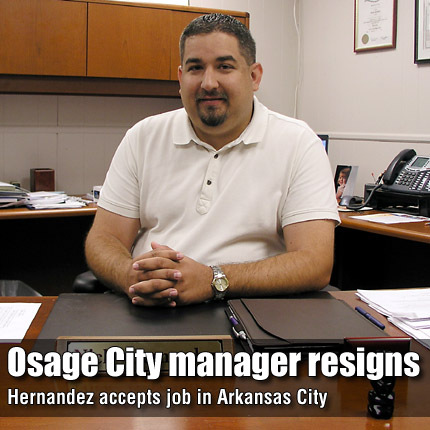 After the meeting, Nick Hernandez, who has been employed at Osage City since August 2008, said he had been offered the position of city manager at Arkansas City, in south-central Kansas. Hernandez’s resignation indicated July 15 will be his last day on the job; his contract with Arkansas City begins July 18. During the five-minute meeting last Thursday, the council voted unanimously to accept his resignation, with council members Leroy Stromgren and Loren DeBaun absent. According to an Arkansas City newspaper, the Arkansas City Traveler, the Arkansas City Commission met briefly the evening of June 16 and unanimously approved a contract with Hernandez through Jan. 1, 2013, with provision for an automatic, one-year renewal on the first day of each year.